Increase revenue with Complete CRM! CRM Software Trends from 2018 and What’s in Store for 2019. What Will Email Marketing Look Like In 2019? Total Cost of Ownership: What does it mean and how can you avoid costly, unsuccessful implementations. Don't be trapped by the Per User subscription structure - here's why. SD Inbound - Recap of HUG17! Is your #Martech stack getting too high? Great Support Team, Great Support. GreenRope Named a Category Leader in Marketing Automation by GetApp! Influencer Marketing: The Future of Marketing? Why we love our jobs. Do you love your job? Surveys: Why, What, and How. Don't Be a Spammer...Here's How. 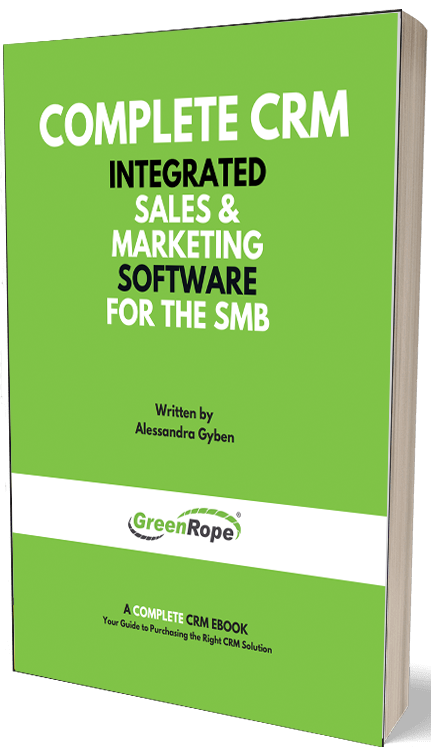 GreenRope is the Best CRM Software! New Year, New You, and Reasonable Goals! Is Inbound Marketing for You? Important Changes for our API Users! Customer Issues are Hard to Track: Ticketing & CRM are the Solutions. Why do we win some deals and lose others? Pain Point #1: I need an information trail! 5 Thankstastic Marketing Ideas for Thanksgiving! The Founder's Blog - Who am I, anyway? The Founder's Blog - What's in a Name? CRM...What's in it for me? GreenRope Sponsors Women's International Hackathon! GreenRope's Latest & Greatest: New upgrades, features, and news! Keith Richmond: Most Admired CFO! 2014 Predictions from the Pros! Using Customer Feedback for Business Growth! Single Opt-in vs. Double Opt-in: Which is more secure? Social CRM: What it is and Why You Need it! CRM isn't easy. There. I said it. I just admitted something most CRM salesperson will deny until the end of their days. Last year, I read study that confirmed that 60% of all CRM implementations are deemed "failures" by people who used them. That number climbs over 80% when you involve any form of automation. Why is that? It's just software, right? And therein lies the problem. Thinking of CRM as software spells doom for any organization. If you think "we'll just get a CRM and it'll fix everything", you're going to cause a revolt, waste a lot of money, or worse, lose productivity on an epic scale. There's a reason I've heard some consultants call CRM the "company killer". CRM - and by CRM, I mean Complete CRM - only works where there's culture to support it. If leadership doesn't embrace it and drive the culture change, getting everyone to adopt it and use it every day, the CRM implementation will fail. And nobody likes to fail. First off, Complete CRM is a concept we embrace and promote from here at GreenRope. To coin a common cliche, we do eat our own dog food. It's about the ENTIRE relationship between the brand and person who will pass through a progression (or funnel) of prospect, lead, client, and champion. That means communicating and listening through every channel you can (email, web, social, offline, etc) and bringing that information together in a useful, meaningful way. To make Complete CRM work, everyone has to be involved. That means more than just a sales manager beating on the salesperson saying "put your notes in the CRM". That means your marketing team sending emails and tracking reads and clicks in the CRM. It means the people who manage the company website install tracking there, so they can see when people in the CRM visit webpages or watch videos. It means event staff managing events, registration, collecting payments and getting that data into the CRM. It means customer service staff managing support issues and getting those into the CRM record for everyone who calls or emails in. Bringing your team into the same platform will eliminate roadblocks preventing relevant information from getting in front of the right people. Some of this information will be automatic (email reads and clicks, website visits, forms, etc), but some will be need to be entered by a person (e.g., notes from a meeting). Both need to be actively part of your culture, which is why I always counsel anyone implementing CRM to repeat the mantra: "If it isn't in the CRM, it didn't happen." Once everyone adopts that, a culture of accountability just happens. Company leaders can lecture about being accountable until their blue in the face, but people who are faking it won't suddenly reverse years of skimping along just because the CEO says she wants more productivity. Accountability happens when people people and processes are measured. The salesperson who is always out "at meetings", the support person who takes long breaks, the marketing person who comes up with crazy ideas that don't seem to pay off, the manager who keeps saying "oh everything is all right" - all of these people can get away with doing the minimum, and company leadership and co-workers often only have their intuition to tell them if that person is an "A" player or a "C" player. Complete CRM changes that. You can see data - cold, hard numbers - that will tell you exactly how well someone is doing. But as good as it is for the company, many people don't like being watched. This has been a strong contributor to CRM failures - if you force people to use software that is only used to keep them in line, people feel like robots, part of a giant machine. The good news is that as effective Complete CRM is at creating accountability, it's just as effective at helping people do what they do better. We've all heard the expression "information is power". Complete CRM provides information to everyone at every level that will re-calibrate what you think is possible. When you see realtime data about every email, webpage, video, event, support ticket, project, form, call, and text message all combined together, you have power like you have never experienced. Suddenly conversations become better targeted and more efficient. Automation takes the place of people doing routine daily tasks, improving efficiency and productivity. Money and manpower is spent on the things that really matter. Recently, we added a CRM Activity Leaderboard into GreenRope. This allows a collaborative approach to seeing everyone and their contribution to the overall growth of the company. Through GreenRope's lead scoring, you can see how many points people on your team are generating. You can set and view quotas this way, as well, so people can be held to a public, common standard. No matter which CRM and marketing automation system you use (of course, I hope you use GreenRope), realize that for it to work, the entire organization needs to use it every day. The success of the implementation - and the company itself - depends on it. Want news and updates from GreenRope? Send me periodic emails with news, software updates, and invitations to events.